Leaf Lugger: A dynamic new invention for the 21st century and "Best Leaf Clean up Product," according to Popular Mechanics and The Week magazine. What happens every fall when the leaves crowd your once beautiful yard?? You grab a rake, some bags, and spend countless hours hauling them from one area of the yard to another. What is a Leaf Lugger?? 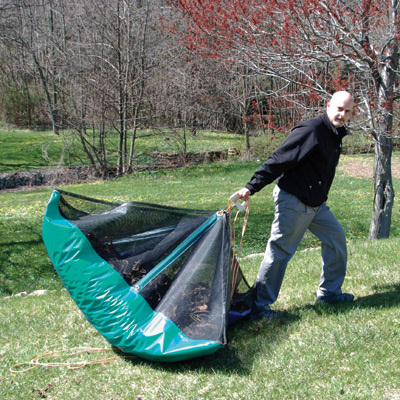 The Leaf Lugger is a leaf tarp that can be placed quickly and easily in your yard or garden to collect leaves. This will help you clean up your yard in half the amount of time it would take trying to fill bags of leaves or even trying to place leaves on a tarp that will move around or blow away in the wind. Why should I buy the Leaf Lugger?? The Leaf Lugger is designed to delete time and effort of trying to fill up plastic bags and wasting time walking back and forth with leaves. Just spread out your Leaf Lugger and rake your leaves onto it. Once you just place your unwanted leaves on the Leaf Lugger, pull the rope to convert it into a bag. Next, pick up the bag to carry the leaves to the destination you desire. Last, find the place you want to dump out the leaves and now you're done. This easy to use invention saves time, effort, and doesn't take up much space when rolled up. Why spend countless hours placing those unwanted leaves in tiny little piles?? Instead, you can get the sturdy Leaf Lugger that will stay in one place and let you rake the leaves from all four directions. This will save time because you aren't trying to place them in a bag after raking them into a nice perfect pile that still leaves pieces of leaves laying in your yard after raking them into a plastic bag. What about the mess of raking?? The Leaf Lugger will close easily and prevent leaves from jumping out all over your nicely raked yard. Once the leaves are raked onto the Leaf Lugger, your yard will be cleaned up. Won't the Leaf Lugger fold or bend as I rake the leaves over it?? No, unlike tarps and blankets this smart tarp technology which has stiffeners built in, prevent it from folding, and the mesh on the outside prevent it from bending or buckling in the wind. What to do after closing up the Leaf Lugger?? The rope surrounding the outside of the Leaf Lugger is a built in handle; once the rope is pulled the Leaf Lugger closes from all directions, it then turns into a bag, and is ready to go to the destination to dispose those unwanted leaves. How do I move my Leaf Lugger once it is filled with leaves?? All you have to do is pick up the bag to carry or drag the filled bag to the destination you desire. Is it easy to store?? Yes, it is very easy to clean and store, just rinse if off, let it dry, and roll it up. Login to add a comment or reply.